March 23rd, 2016 – We all carry keys with us: keys to doors, cars, lockers, you name it — anything we feel is valuable enough to put a lock on. But very few people own a Key to the City of Ottawa. An ornamental key – the Key to the City – is presented to esteemed residents, visitors and others whom the City of Ottawa wishes to honour. The key is symbolic of medieval walled cities, the gates of which would be guarded during the day and locked at night. Being given such a key means the recipient is free to enter and leave the city whenever they want, as a trusted friend of city residents. 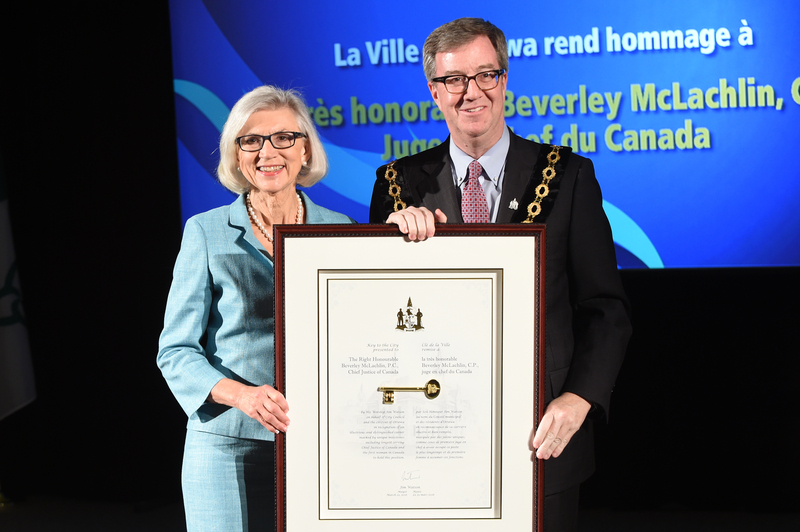 On Tuesday, March 22, Mayor Jim Watson presented the Key to the Right Honourable Beverley McLachlin, P.C., Chief Justice of Canada. She was the most recent of 85 individuals and organizations to receive Ottawa’s highest honour. Chief Justice McLachlin is the 17th and current Chief Justice of the Supreme Court of Canada, the first woman to hold this position, and the longest serving Chief Justice in Canadian history. November 4, 1935, to Lord and Lady Tweedsmuir as they arrived in Ottawa to begin Lord Tweedsmuir’s term as Canada’s Governor General. Past Key-to-the-City recipients include Her Royal Highness The Princess Elizabeth (now Queen Elizabeth II), Her Royal Highness Princess Margriet of the Netherlands, author Margaret Atwood, photographers Yousuf and Malak Karsh, the Community Foundation of Ottawa, actress Sandra Oh and Ottawa Senators captain Daniel Alfredsson.